Last spring (2008) we decided to do a block exchange for a group project. There were twenty of us involved. We planned to make 21 blocks and then make a quilt with the extra block and present it to the owners of the resort where we hold the retreat. We decided to use autumn colors and a retreat, cabin or woods theme. Each quilter who contributed a block decided on their own block design. My choice was to applique leaves on my block. It is the block in the second row from the top on the left side. 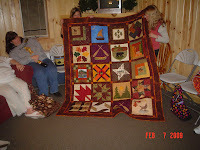 It was fun to see everyone's block and how they all went together to make such a wonderful quilt. At the fall retreat, we exchanged the blocks and then someone took the blocks home to put together and quilted it for the resort owners. We presented the resort owners with the quilt at our Saturday night "Show and Tell" session. The photo on the left is what the quilt looked like. I believe the resort owners were very touched by the quilt. Several others had completed their own quilt with their blocks set slightly in a different manner, of course. It inspired me to get my done. Look for a photo of my quilt in the near future.